For the last few months I've been working on a Xamarin.Forms guide, about building cross-platform enterprise apps. The first edition of the guide is now published as an eBook, and can be downloaded here, or by clicking the image below. 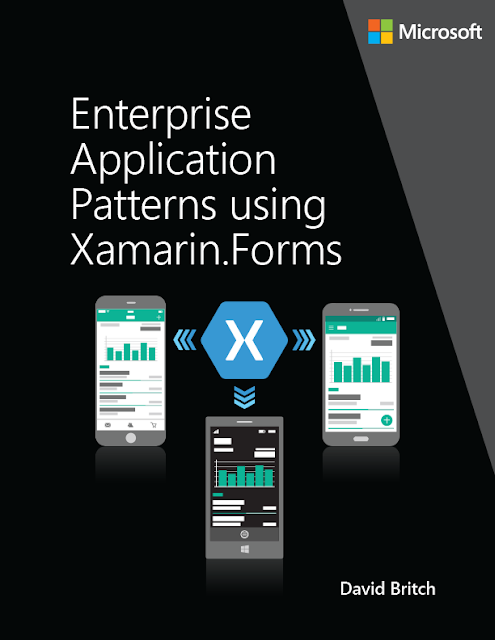 The eBook provides guidance on building cross-platform enterprise apps using Xamarin.Forms. It focuses on providing architectural guidance for developing adaptable, maintainable, and testable Xamarin.Forms enterprise apps. Guidance is provided on how to implement MVVM, dependency injection, navigation, validation, and configuration management, while maintaining loose coupling. In addition, there's also guidance on performing authentication and authorization with IdentityServer, accessing data from containerized microservices, and unit testing. The guide comes with source code for the eShopOnContainers mobile app, and source code for the eShopOnContainers reference app. 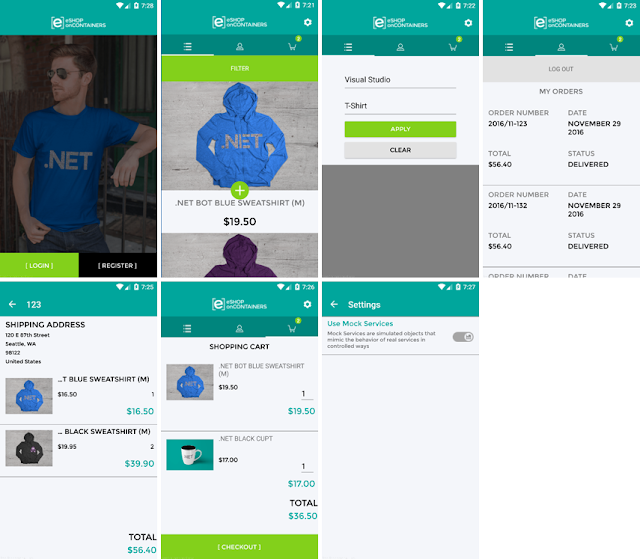 The eShopOnContainers mobile app is a cross-platform enterprise app developed using Xamarin.Forms, which connects to a series of containerized microservices known as the eShopOnContainers reference app. The guide is aimed at readers who are already familiar with Xamarin.Forms. For a detailed introduction to Xamarin.Forms, see the Xamarin.Forms documentation on the Xamarin Developer Center, and Creating Mobile Apps with Xamarin.Forms. 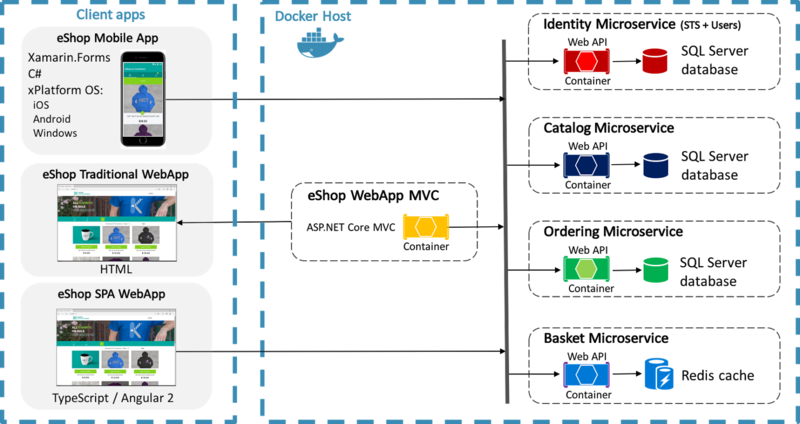 The guide is complementary to .NET Microservices: Architecture for Containerized .NET Applications, which focuses on developing and deploying containerized microservices. What's in the sample application? Authenticating and authorizing against a backend service. Viewing the user's order history. A Single Page Application (SPA) developed with Angular 2 and Typescript. This approach for web applications avoids performing a round-trip to the server with each operation. A mobile app developed with Xamarin.Forms, which supports iOS, Android, and the Universal Windows Platform (UWP). For information about the web applications, see Architecting and Developing Modern Web Applications with ASP.NET Core and Microsoft Azure. A catalog microservice, which is a data-driven create, read, update, delete (CRUD) service that consumes an SQL Server database using EntityFramework Core. An ordering microservice, which is a domain-driven service that uses domain-driven design patterns. 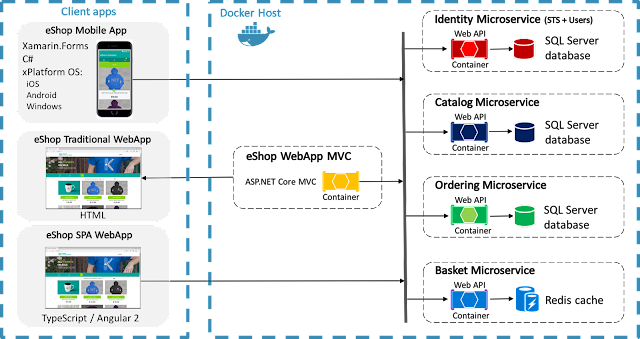 These backend services are implemented as microservices using ASP.NET Core MVC, and are deployed as unique containers within a single Docker host. Collectively, these backend services are referred to as the eShopOnContainers reference application. Client apps communicate with the backend services through a Representational State Transfer (REST) web interface. For information about the implementation of the backend services, see .NET Microservices: Architecture for Containerized .NET Applications. The mobile app consumes the backend services provided by the eShopOnContainers reference application. However, it can be configured to consume data from mock services for those who wish to avoid deploying the backend services. In addition, unit tests are provided for some of the classes in the eShopOnContainers mobile app. For more information about this functionality, see the Xamarin.Forms documentation on the Xamarin Developer Center, and Creating Mobile Apps with Xamarin.Forms. Where can I get help and provide feedback? This project has a community site, on which you can post questions, and provide feedback. The community site is located at https://github.com/dotnet-architecture/eShopOnContainers. Alternatively, feedback about the eBook can be emailed to [email protected]. I really loved your guide! I need to add the "MasterDetailPage mechanism" to a project structured like the sample app "eShopOnContainers", how can I do this? I have tried but when I call NavigationService.NavigateToAsync(); nothing happens. The NavigationService class in the app is only designed for navigating to ContentPage instances. You should take a look at Prism for a NavigationService class that works with all the different page types.